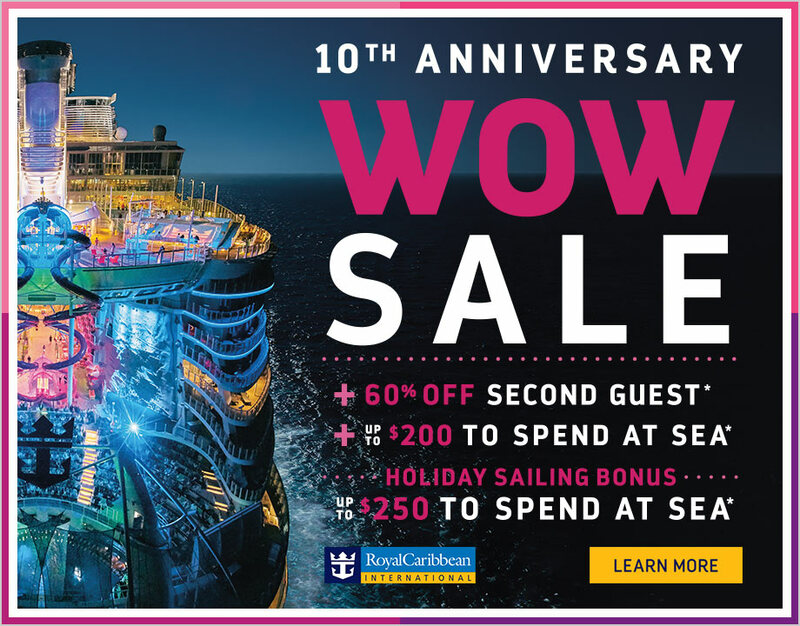 Royal Caribbean is celebrating the 10th anniversary of its most popular sale, the WOW Sale, with another WOW sale! Guests that book a Royal Caribbean cruise between June 14-16, 2017 on sailings departing on or after July 14, 2017 (excluding China departures) are eligible for the WOW sale. Kids Sail Free offer provides free cruise fare of third and higher guests who are 12 years or younger as of cruise departure date, booked in the same stateroom as the first two qualifying guests in a triple or quad occupancy stateroom on 5 nights or longer Bahamas and Caribbean sailings departing Sep. 1, 2017-May 31, 2018, excluding sailings departing 11/17/17-11/27/17, 12/17/17 – 1/8/18, 2/15/18-2/20/18 and 3/10/18-4/1/18. All other charges, including, but not limited to, taxes, fees and port expenses, are additional and apply to all guests.